Press the key to change the mod mode in order of CD ➟ USB(iPod®) ➟ AUX ➟ My Music ➟ BT Audio. To repeat folder (pressing twice): repeats all files within the current folder. Random (Press the key): Plays all songs in random order. All Random (pressing twice): Plays all files in random order. Shortly pressing the key : Plays the current song from the beginning. ❈ If the key is pressed again within 3 second, the previous song is played. Shortly pressing the key : Plays the next song. Press the key Set [ RPT] through the TUNE knob or key to repeat the current song. Press the key Set [ RDM] through the TUNE knob or key to randomly play songs within the current folder. Press the key Set [ Info] through the TUNE knob or key to display information of the current song. Press the CD MP3 mode key to set the Repeat, Folder Random, Folder Repeat, All Random, Information, and Copy features. Press the key Set [ F.RDM] through the TUNE knob or key to randomly play songs within the current folder. ❈ Press F.RDM again to turn off. Press the key Set [ F.RPT] through the TUNE knob or key to repeat songs within the current folder. ❈ Press F.RPT again to turn off. Press the key Set [ A.RDM] through the TUNE knob or key to randomly play all songs within the CD. ❈ Press A.RDM again to turn off. Press the key Set [ Copy] through the TUNE knob or key. This is used to copy the current song into My Music. You can play the copied Music in My Music mode. ❈ If another key is pressed while copying is in progress, a pop up asking you whether to cancel copying is displayed. 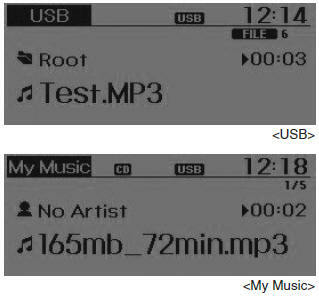 ❈ If another media is connected or inserted (USB, CD, iPod®, AUX) while copying is in progress, copying is canceled. ❈ Music will not be played while copying is in progress. In iPod® mode, press the key to set the Repeat, Album Random, All Random, Information and Search features. Press the key Set [ Alb.RDM] through the TUNE knob or key. Plays albums within the currently playing category in random order. ❈ Press Alb.RDM again to turn off. Press the key Set [ A.RDM] through the TUNE knob or key. Press the key Set [ Search] through the TUNE knob or key. ❈ Searching iPod® category is key pressed, move to parent category .